This is delicious! Seriously, you need to try this!! Even if you are (like me) a little on the fence about coriander, this could be the dish that changes your mind. When we go out to eat for birthdays or special occasions, Nandos is often the restaurant of choice. We went there for my birthday this year and then went back the following day for my Father in laws birthday! Who doesn’t love Nandos two days in a row? When I go to Nandos I usually order the chicken pitta with pineapple. (It’s not clean, but it’s a pretty good kind of not clean). I LOVE it, it is stuffed with salad and coriander and the juiciest grilled pineapple ring ever. That new, fresh combination is the inspiration for this beautiful salsa. 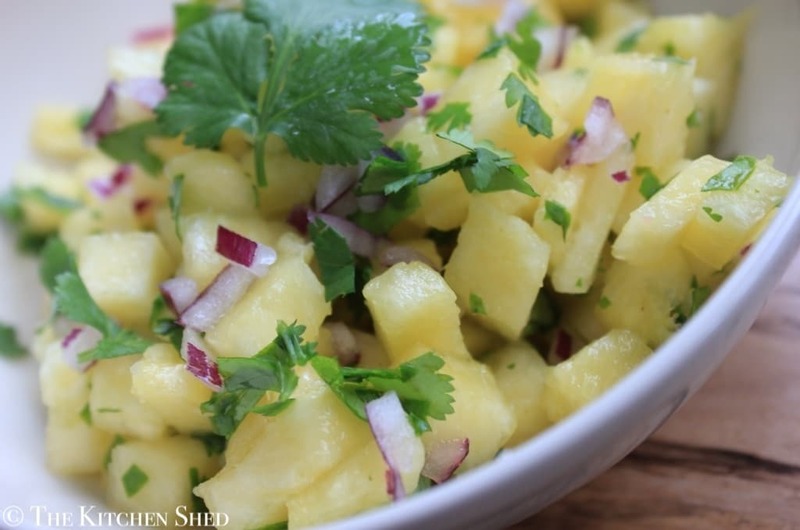 Clean Eating Pineapple Salsa is a little piece of Nandos in my home. I could eat it with anything, just give me a spoon and I will be happy! It is so versatile and makes any meal a little bit more special. It is quick and easy to make, you only need 3 ingredients. If you are not a fan of raw red onion you can swap it for spring onion, or just leave it out all together. 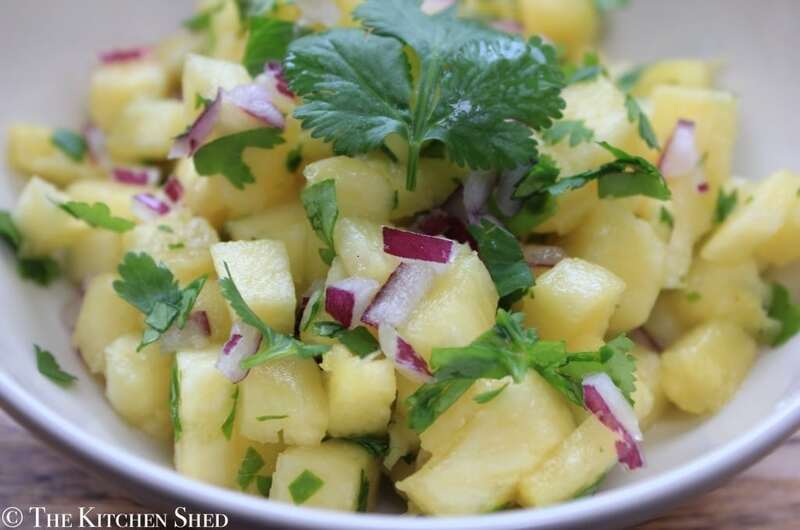 The pineapple and coriander are the main event. Mmmmmm… so good!! 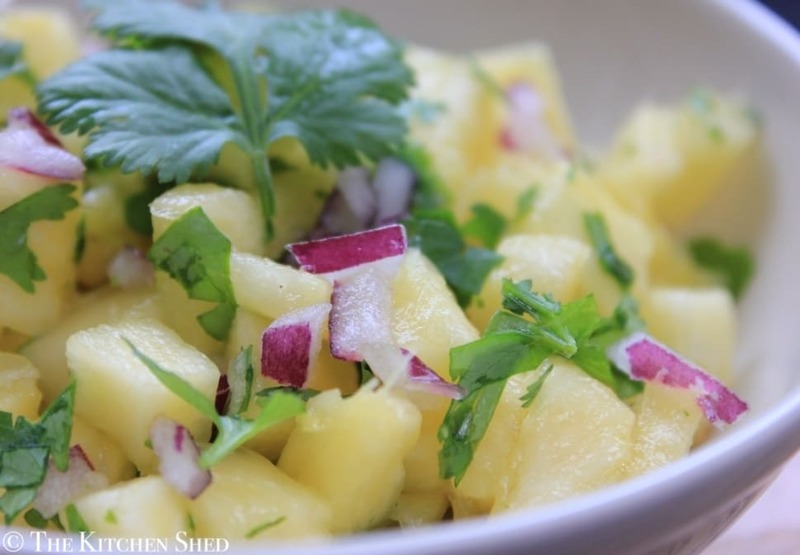 Clean Eating Pineapple Salsa is so versatile and makes any meal a little bit more special. It is quick and easy to make, you only need 3 ingredients. Combine all chopped and diced ingredients in a bowl. Add more onion or coriander to taste. Ooh, did you try it Tammy? It’s one of my most favourite things to eat on the blog so far!